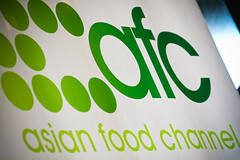 Start airing on AFC (Asian Food Channel) this November 2011, is one food adventure show which based on Indonesian eateries, titled "Taste of Indonesia". The show is hosted by a father and daughter duo, Bondan and Gwen Winarno. Perhaps less known to the audience outside Indonesia, Bondan Winarno is a national celebrity; food-celebrity to be precise. His friendly face and smile greets national TV audience regularly on weekends, through various cooking & eating shows. He also leads a tribe of foodies "Jalansutra", a term which means "Knowledge on Jalan-jalan (Traveling)", which includes surely the activity of eating -- two things that "Pak Bondan" enjoys very much since back from the time when he's regularly traveling around Indonesia and the world as a journalist. While quite famed himself, Pak Bondan are best known for the phrase he helps popularized and has becoming his trademark; "maknyus!" or the more complete "poko'e maknyus!" I used to eat with Umar Kayam and Gunawan Muhammad. Everytime we encounters good food, Pak Umar Kayam always say, "This is maknyus, superb." Due to it's uniqueness and popularity, "maknyus!" has becoming the new standard of anything uber good, and it doesn't stop with cooking & eating subjects. It is applicable for virtually anything. Besides of maknyus, what are other food expressions commonly used in Indonesian? Let's find out below; as for pronounciation guide please refer to this WikiTravel article. Got any more to add?